A week after Holocaust Memorial Day (when Donald Trump failed to mention the Jewish victims), and in the expectation of an imminent visit from Netanyahu to Britain, hundreds of Jewish people speak for the majority of Jews in signing an advert opposing the Occupation of Palestine. 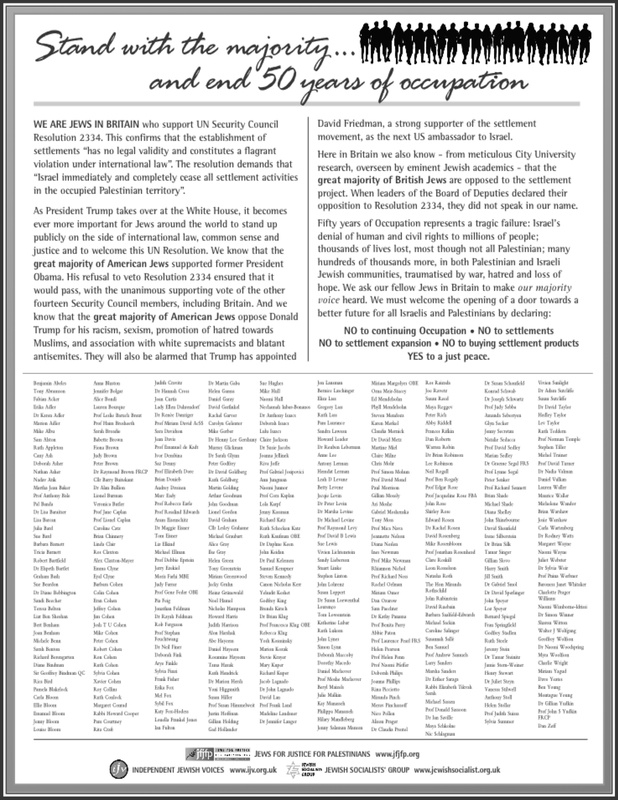 With Trump and Netanyahu declaring mutual support, and Netanyahu's imminent visit to Britain for talks with the Theresa May, hundreds of Jews have signed a a full-page advert in the Jewish Chronicle supporting the anti-settlements UN Security Council Resolution 2334 and calling for a boycott of settlement products. The advert describes the Occupation as "a tragic failure" resulting in "Israel's denial of human and civil rights to millions of people, thousands of lives lost, most, though not all Palestinian". It says, "When the Board of Deputies declared their opposition to Resolution 2334, they did not speak in our name." It adds: "As President Trump takes over at the White House, it becomes ever more important for Jews around the world to stand up publicly on the side of international law, common sense and justice." The advert was originally intended for the Jewish News, a free community newspaper which describes itself as "the most widely read Jewish paper" in the UK, and is proud that "Britain’s Jewish community has never been more dynamic and diverse than it is today". Shamefully, a week after Holocaust Memorial Day when we hear so many absolutely correct injunctions not to be bystanders when we witness wrongdoing and injustice, they refused to take it on political grounds. The Jewish Chronicle had no such qualms, but it was a lot more expensive. The plan was to place a half-page advert, but it had so much support, matched by donations, that we were able to run it as a full-page. The times they are a-changing. The advert was placed by the Jewish Socialists' Group, Jews for Justice for Palestinians and Independent Jewish Voices.